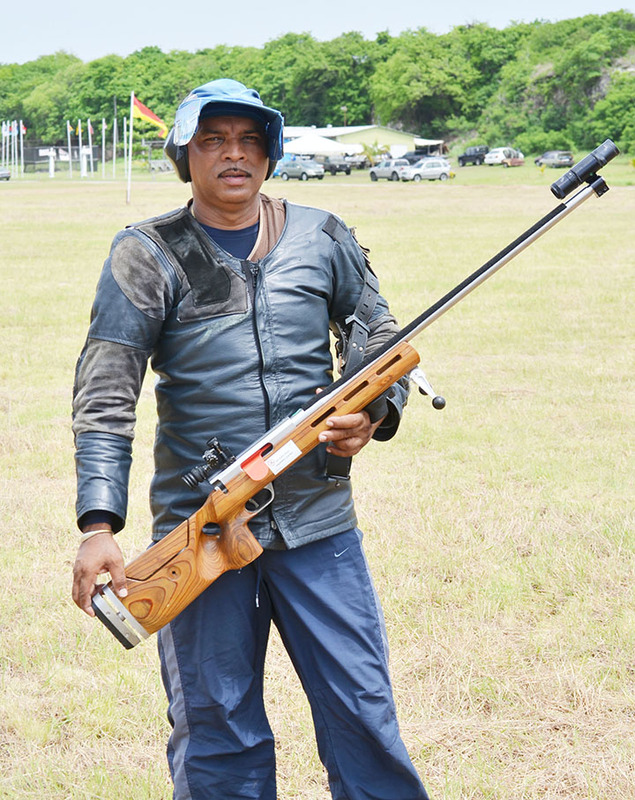 National fullbore skipper Mahendra Persaud said his team will need to make every shot count when they begin their title defence in the 2016 West Indies fullbore Shooting Council (WIFBSC) Short Range Championships which takes place in Antigua from May 16-22. Persaud, during an interview with Stabroek Sport yesterday, said the specific location of the tournament makes the stakes higher for the national side who lost to Jamaica by one point a few years ago. This time, however, the captain is confident that his team will be able to complete what he calls the “Circle”, by winning in the only Regional territory that they lost in a few years ago. “This is a very serious tournament for us because we made a mistake in Antigua about four years ago when we were about to complete the `Circle’ of territories we won in but then we lost to Jamaica by one point and what hurt us was that we knew we could have gotten it from anyone,” said Persaud. A few of the senior shooters in the team; Ransford Goodluck, Lennox Brathwaite, Leo Romalho and Dylan Fields showed good form during the recent practice team shoot held at the Timehri Rifle Ranges last week and Persaud confirmed that they will have one more practice match this Saturday to further assess and finetune any technical problems any marksmen might have. “Preparations are coming to come, I’m not a 100 percent good with it so that’s why we will be having one final practice match on Saturday to finetune some little things that we have observed with some of the shooters. Basically the team is strong and confident we just want to iron out a few things, because some of the shooters need some tuning”, “What happens is that they will go to the first range wouldn’t be hot, then they will move onto the second or third and then they will be hot but by then you might lose points. It’s something that has been happening for years and we haven’t been able to conquer that but I feel we have the confidence now to do so,” he stated. While Saturday’s final match will be a four-on-four encounter, which according to Persaud, will help all the shooters to “iron out any kinks,” the actual championships will see three days of individual shoots while the final two phases will be the team shoot which Persaud said his guys will be equal to the task as they look to dominate both formats. The veteran sniper said a more fundamental approach will be the key to winning this competition adding that apart from a few minor adjustments, most of the players have already begun to take a simplistic approach ahead of the competition. “Five of us have been there close to 20 years and we know who we could count on and even the young shooters I have confidence in. We reach Antigua on Monday morning, we get our gear and it’s straight to practice followed by the start of the competition the next day, so Saturday’s practice match should keep us fresh until then. “We just need to do the best we can and hopefully the best will be good enough. We will definitely need to put out good scores while doing everything as we know it and we can’t lose, because no one beats us, we just lose,” said a confident Persaud. Apart from the senior crop of shooters, Persaud said six other shooters will be vying for the final three spots for the eight-man team, adding that the opening leg of the tournament which will be the individual shoot will allow them to scout the final eight players who will make up the team and those gunners will be selected on the morning of the shoot. With Guyana set to host the 2017 West Indies tournament the second week in October, Persaud added that himself, along with a few other shooters will be participating at Bisley, as well as other meets in Canada following the conclusion of the championships in Antigua. Some 100 shooters from countries like England, United States of America, and Canada will participate in the event next year in Guyana while Persaud said South Africa and Australia have signaled their intentions to compete but said he will make a more concrete announcement regarding the two countries upon his return from Bisley.